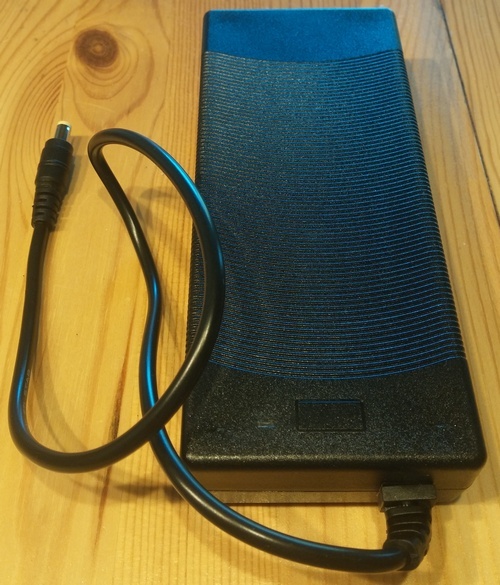 The battery pack manufacturer stated that the individual cells would be short-circuit proof. The question was, does the same hold for the entire pack? The only way to find out is to: short it. And that didn’t go too well. The cells appeared to stay calm, but the cell connector straps got so hot that they melted. The bluish stuff is residue from the adhesive stickers that the manufacturer applied for isolation. These literally caught fire. I hoped for a different outcome of this test, but to be honest, I had quite expected what happened. Interestingly, a pair of cells did actually go open during the test, preventing further current flow. The manufacturer appeared to be right when stating that the cells would be short-circuit proof. I think you are making this too difficult. The batteries can easily be ordered from eBay. So the kit should not include batteries. Also eBay can easily sell you balancers and chargers and power supplies. So just instruct the kit buyer what models to get and how to connect them. So supply the hard to find parts – motor, controller, input devices, etc. I’ afraid this project is currently on hold, I am busy with the spot welder. I will continue this once that is up and running. 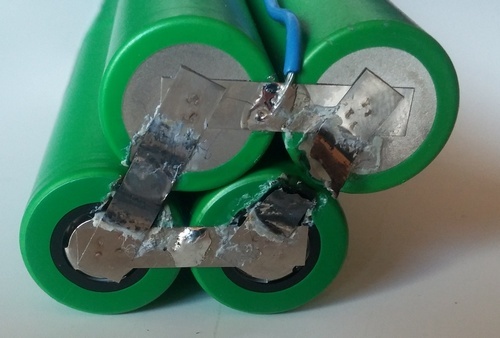 Ebay has the round cells, but I am developing a battery pack that perfectly fits the model mechanically. My spot welder is indeed a way to enable my customers making their own compatible pack, and I probably will also sell the BMS on its own. But I see a business in providing the complete chain, because the volumes will be higher and I hope to be able to offer a better price then. The keenlab concept features an integrated charging solution, you don’t have to remove the battery to charge up the vehicle. This means that the BMS has to be integrated and an external balancer charger is not meaningful then. And yes, chargers (or in this case, 5A current limited 25.2V power supplies) are also available. But it is not easy to find a suitable one at ebay. If you have something at hand, I would be glad to know. I didn’t find anything, not on ebay, nor on Alibaba. Do you really need a BMS when you can buy an off-the-shelf balancer for $7 and an off the shelf charger for $4? You can get a cheap 20V or 24V power adaptor. Then you need a charger DC-DC CCCV step up-down converter. This will be adjusted to 25.2 V, and the current limited as needed. Then a balancer-protector, which is a 4cm x 5cm board and can easily fit in the bay. These can easily be found on eBay. http://www.ebay.com/itm/6S-10A-24V-25-2V-Li-ion-Lithium-18650-Battery-BMS-PCB-Protection-Board-Balance-/322460026383?hash=item4b141d860f:g:Zx8AAOSwzT5ZeE4B and http://www.ebay.com/itm/150W-DC-DC-Boost-Converter-10-32V-to-12-35V-6A-Step-Up-Charger-Power-Module-/201542939715?epid=712070379&hash=item2eece53443:g:1QIAAOSwdAxZbJHw Can I ask where to obtain the in-hub motor and a suitable controller? Yes I do. Every battery that contains a significant amount of lithium is subjected to certain rules with regard to product safety. And the United Nations issued further rules for shipping them, especiall in aircrafts. That is summarized in UN38.3. There are a lot of requirements that cannot be achieved without a BMS. Please do not confuse this with a hobby part like one of these Lipo packs that catch fire when you touch them the wrong way. This is a professional product and needs to oblige to these requirements. Another reason for a dedicated BMS: you can always choose make or buy. If I make, then I have added value and profit. The charger is just what you describe, but it is not a two-stage converter, but a wall adapter that outputs 25.2V / 5A in CCCV fashion. Thanks for your reply. Actually I am speaking of 18650 Li-ion cylinders, for example by Panasonic (same as in a Tesla). I would never go close to a Lipo pack. I am building a 12 kWh pack 8s12s10p using off-the-shelf boards and 18650 cells. Each cell is 12.6 Wh, and $3.50. There will be 8 modules, each 1.5 kWh and each 12s10p In EVs, you must have 96s (about 400V). This is so that I can extend the range of my Leaf by 50%. Each module will have one 600W charger and a 13s balancer-protector. The power supplies will be 1500W each and shared by the chargers. Total of 3 or 4 power supplies. The CCCV charger I linked above does not include the adapter. It would need let’s say a 20V or 24V wall adapter. It requires DC input. So may I ask what can your BMS do that cannot be done with a CCCV step-up charger and a balancer-protector, as linked above? What added value does the BMS offer? Adding value makes sense, but it is not clear to me what value is being added. The Panasonic cells are the safest Li-ion cells in existence. And the electronics are the same as those being used in countless products from China such as e-bikes. Very impressive project! Is there info about in the web? I am also talking about 18650 LiIon round cells, I just named the Lipo for typical high-risk hobyyist’s uses. It’s one thing when you build packs on your own (as you are doing that, maybe you are also interested in my spot welder?) – you can do what you want, as you are taking responsibility of your own risks anyway (I’ve been doing the same thing in the early time of the keenlab scooter, except that the controller board had a fuse). And it’s another thing when I want to *sell* these packs. I have to stay within law, and I named UN38.3 as an example. The battery safety tests of a CE certification are basically the same. These conditions cannot be met by the (unprotected) individual cells already. For example, they have no means to keep them from being deep discharged. There are more of these rules, but these are ensured by the cells itself already. Just have a look at UN38.3, you can find public documents on those. This is exactly what the BMS does, additionally it also includes the cell balancer. Making things worse, all of these features *must* be available at the battery pack terminals (even when that terminal is short-circuit protected -I’ve already had discussions with the German TUEV). It is not allowed to move certain protection measures to other places, like into the CCCV charger, or into the motor controller. The pack itself must be able to pass all safety tests. And I don’t really see the point 🙂 I integrate your $7 balancer into my BMS for less than $7 (my purchase price of course), and I integrate your charger and your wall adapter into a CCCV charger wall adapter (directly connected to the battery) at a price that may surprise you. You can roll a dice in which category your purchased gadget is, and I’ll take the bet that most of them are in the third. I have not published my results, just discussed it on various message boards. Yes, I am interested in the spot welder. And yes, I agree there is a huge difference in safety and productization issues between a commercial product and a personal product. All the protection features you have mentioned is offered by the eBay link (or similar boards) for the balancer-protector. The board has two MOSFET in series with the battery input/output. Note that there are many BPB boards on offer at eBay and some may not have all the features, such as thermal protection. But most do have all these 8 features. There are also board that only balance and should not be confused with a BPB. There should be no issue finding parts for a 100 Wh to 500 Wh pack. Maybe when one reaches 1 kWh or more per module, then it may be hard to find the right parts. I plan to build my own arduino based BMS after I complete the 12 kWh project using off-the-shelf boards. This will be for the next project of a 100 kWh pack for a sailboat. It will have active fire suppression. All cells are 18650 or 2170. There will be no active cooling as I do not plan to do high-current applications. Yes, the BPB will be inside the pack. And so will the charger be inside the pack. But the power supply is external to the pack. The charger also offers some protection, so the BPB and the charger are offering double protection. For example there will be a fuse between the charger and BMS. 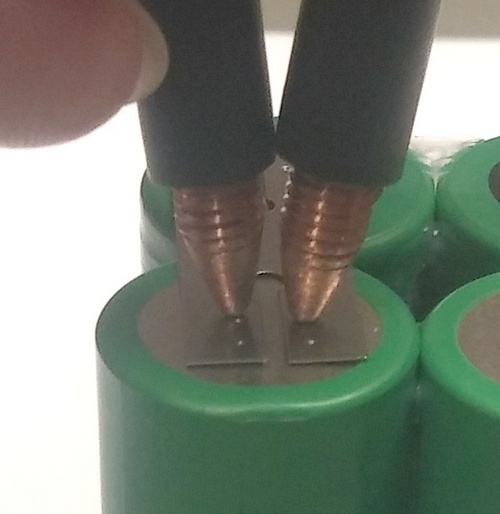 Also note that each cell will have its own little wire fuse before it is connected to the group. This is a must. Thus with the unprotected Panasonic 18650 cell at 2C discharge, you have 7 A. The individual fuse will be 10 or 12 A.
I doubt you can beat the price of Chinese producers who make 100,000 BPB or chargers in a production line. And then there are certified producers, and non-Chinese producers, and it will be tough to beat their prices, unless you plan to sell 1,000 of these kits. BTW, Oxelo is offering e-scooters. So I am not sure how that impacts your plans.